In preparation of our CCNA exam, we want to make sure we cover the various concepts that we could see on our Cisco CCNA exam. So to assist you, below we will discuss the 7 Layer OSI Model. The standard model for networking protocols and distributed applications is the International Standard Organization’s Open System Interconnect (ISO/OSI) model. It defines seven network layers. 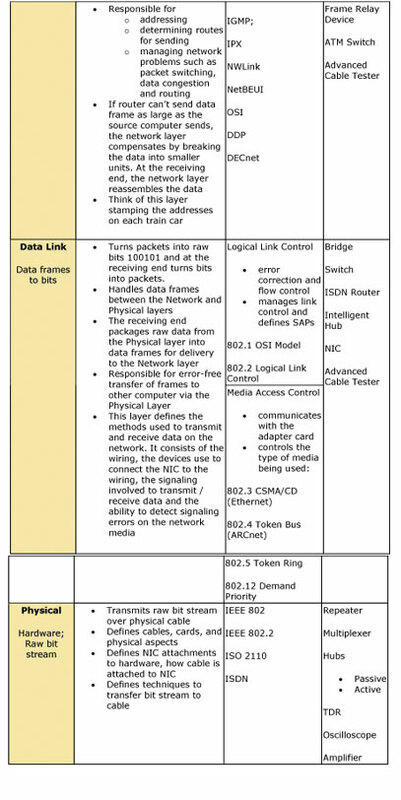 Data Link layer defines the format of data on the network. A network data frame, aka packet, includes checksum, source and destination address, and data. The largest packet that can be sent through a data link layer defines the Maximum Transmission Unit (MTU). The data link layer handles the physical and logical connections to the packet’s destination, using a network interface. A host connected to an Ethernet would have an Ethernet interface to handle connections to the outside world, and a loopback interface to send packets to itself. Ethernet addresses a host using a unique, 48-bit address called its Ethernet address or Media Access Control (MAC) address. MAC addresses are usually represented as six colon-separated pairs of hex digits, e.g., 8:0:20:11:ac:85. This number is unique and is associated with a particular Ethernet device. Hosts with multiple network interfaces should use the same MAC address on each. The data link layer’s protocolspecific header specifies the MAC address of the packet’s source and destination. When a packet is sent to all hosts (broadcast), a special MAC address (ff:ff:ff:ff:ff:ff) is used. Transport layer subdivides user-buffer into network-buffer sized datagrams and enforces desired transmission control. Two transport protocols, Transmission Control Protocol (TCP) and User Datagram Protocol (UDP), sits at the transport layer. Reliability and speed are the primary difference between these two protocols. TCP establishes connections between two hosts on the network through ‘sockets’ which are determined by the IP address and port number. TCP keeps track of the packet delivery order and the packets that must be resent. Maintaining this information for each connection makes TCP a stateful protocol. UDP on the other hand provides a low overhead transmission service, but with less error checking. NFS is built on top of UDP because of its speed and statelessness. Statelessness simplifies the crash recovery.